Hopevale is a small rural community in the mountains of Capiz province on Panay island (Visayas region of the Philippines). Last Fall they experienced a number of small earthquakes that led to tension cracks and the threat of landslides throughout their community. As a result, the community was forced to leave their homes and rebuild their community in a new location. Melanie and I have had the privilege of spending some time in this community and we are blown away by the ‘HOPE’ that they have demonstrated despite the tremendous hardships that they have endured. 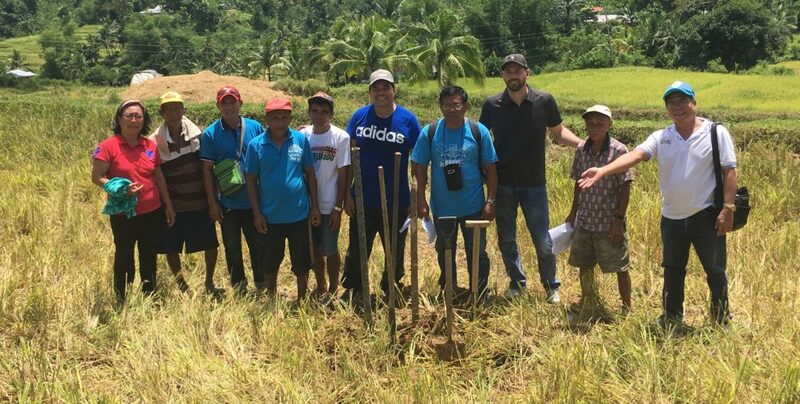 Together, in partnership with Kabuganaan Philippines Ministries (KPM), Canadian Baptist Ministries is journeying with this community as they rebuild. This coming November, a team of 8 people from Midland Baptist & Kingston Baptist (New Brunswick) will be traveling to Hopevale to SERVE and LEARN alongside of this amazing community. The team from New Brunswick will be assisting the community in the construction of a new building that will primarily serve as their church, childcare centre, community centre, and evacuation/emergency shelter. CBM, in partnership with KPM is also assisting in the construction of a new water reservoir and pump system for the community that will provide the entire community with access to clean drinking water for many years to come. This past week we were blessed as a family to attend and participate in the ‘Ground Breaking Ceremony’ on behalf of Canadian Baptist Ministries. What an absolute joy to join with this community as they celebrate these new beginnings! For the past year our Marketplace Ministry team, made up of field staff and Canadian staff, has been meeting monthly (via Skype) to share and discuss ideas and opportunities for marketplace engagement, both in our fields of work and in Canada. CBM has given the name CO//323 to our global focus on marketplace ministry, based on Colossians 3:23 which says, “Whatever you do, work at it with all your heart, as working for the Lord”. CO//323 is a movement of God’s people who believe transformation can happen when faith and work intersect. Our goal is to stimulate conversation, build connecting points and incubate new ideas about living out faith every day – not just on Sundays. Handmade. For Good. This October saw the launch of CBM’s newest initiative, the 323 Collective. The 323 Collective is an online store which features global craft makers and entrepreneurs willing to contribute their handiwork in service of those who need a hand-up. When you purchase an item, the proceeds go to support people in need around the world. October 12th to 20th – Michael will be traveling to Chiang Mai, Thailand to attend a ministry consultation with over 1200 others from the region. Please pray for traveling safety and for the learning and networking that will take place during this consultation. November 4th to 16th – Short-term Mission team from Midland & Kingston Baptist Churches (New Brunswick) will be joining the community of Hopevale in the rebuilding of their church/community centre building and water reservoir. Please pray for traveling safety and for good health and safety during their time in the Philippines.